What is Growth Factor Therapy? Growth Factor therapy is the recent technology for the treatment of Hair Loss. 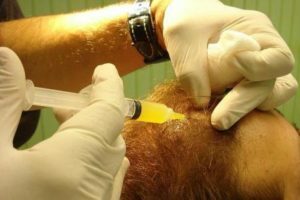 The essential nutrients which are there in the growth factor injections help in stopping the hair loss and regrow the hair. These compounds can stimulate the growth of human mesenchymal cells and help to protect them from free radical attack. These growth factor injections are given into the scalp with micro-needle at 2-4 mm depth. The whole treatment takes about 15-20 mins. Frequency of injections - weekly or once in 15 days , 6-10 sessions are required depending upon hair condition.